Vår kropp syntetiserar vitamin A från betakaroten i de belopp som krävs. Betakaroten spelar en viktig roll i försvaret av fleromättade fettsyror mot fria radikaler och hjälper till att upprätthålla normal cellfunktion . 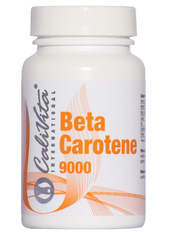 Beta carotene is a carotenoid with antioxidant activity. It is the basis for the production of vitamin A, which means that the body, depending on their needs, converts beta carotene into vitamin A. 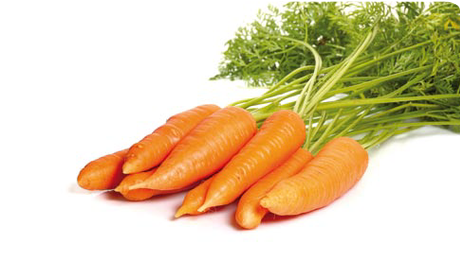 Beta carotene is essential for a healthy and beautiful skin. Its antioxidant action protects the cells from damage by inhibiting activity of dangerous free radicals. It is therefore important, not only for the protection of internal tissues of the skin, but also to the lining, which is a large area exposed to various harmful substances. Therefore some scientists attribute it a significant role in cancer prevention. Vitamin A is obtained from beta-carotene is also known as beauty vitamin and acting on the tenderness and firmness of the skin, prevents nail brittleness and hair loss, and is used primarily for growth and cell renewal. One of the tasks of beta carotene is neutralized and rendered safe by aggressive substances, so-called free radicals, which are formed under the influence of solar radiation in the body, contributing to the prevention of skin damage incurred by exposure to skin damaging UVA and UVB rays. At the same time pigment carotene benefits to our skin beautifully darkens. However, the skin is exposed to UV radiation only in summer but throughout the year, because the intensity of UV radiation also depends on latitude, altitude and reflection on the ground, a highly reflective snow that is deducted up to 80% of radiation. UV radiation has harmful effect on the skin and the eyes, and can cause the development of cataracts (cataract). 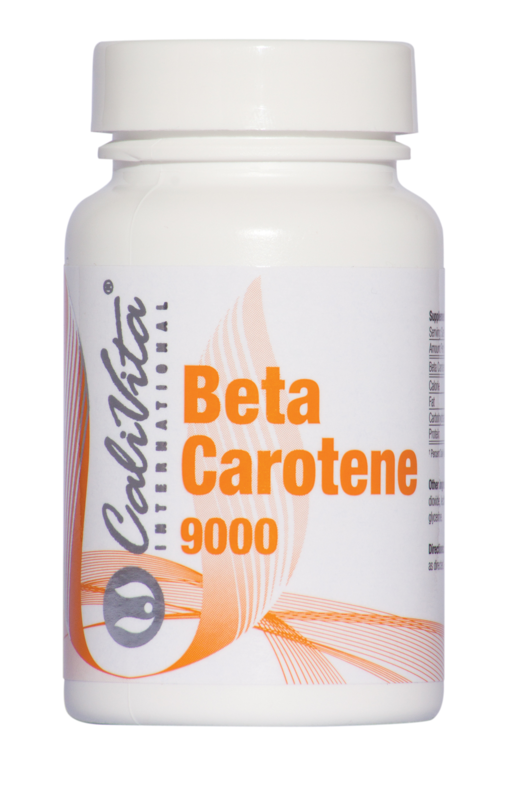 Beta carotene is used as a pigment and present in the variety of fruits and vegetables. It is certainly the most important nutrient for skin health and protection from radiation. Increased intake of supplements with beta-carotene, makes that it is naturally accumulated in the skin, but also in arterial plaques, forming a strong antioxidant protection to the skin, and the damaged artery. It has been shown that beta carotene may slow the transformation of normal cells into malignant - caused by various carcinogens, and one of the most commonly used in laboratories - UV radiation. 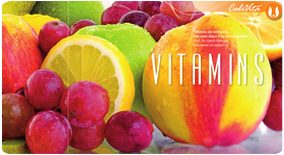 Vitamin A (beta carotene) can be associated with all issues related to disorders of the skin and mucous membranes (psoriasis, acne, ulcers, ulcerative colitis, respiratory infections, digestive disorders, vaginal infections, etc.). Signs of lack of: dry skin, flaking, impaired vision and night blindness, disturbances in growth, susceptibility to infections, the occurrence of ulcers. Beta carotene is recommended for all as an ideal radiation protection, especially in the spring and summer, but also during the winter because the winter does not reduce the harmful effects of UV rays, especially if you are visiting a tanning salon or go skiing. Beta carotene can be taken in higher doses without fear that accompanies taking pure vitamin A (it is deposited in the liver can have a toxic effect). The body converts beta carotene into vitamin A only when it needs it. It is a known phenomenon of yellow palms which indicates that we have entered too much beta carotene. This phenomenon is completely harmless, and the break in taking beta carotene yellowing will just disappear. Cooking, freezing and canning destroy about 50% of natural beta-carotene in food! We are witnessing climate change like no generation before. Our planet is constantly changing, and with it change us like all other species, adapting to situations in the best possible way. Because it's an old formula to preserve the species. Adapting to today for a man is to realize the dangers that threaten it, and provide the organizm those active substances to help him on the way to preserve health. In cloudy days can not get sunburn. WRONG. Although clouds weaken direct UV radiation, they contribute to increasing the diffuse UV radiation. The high, thin clouds miss up to 80% of the radiation, and can in some places increase UV energy. The only good protection are low, thick clouds. Too much sun exposure is dangerous, regardless of age. EXACTLY. Human skin and immunity system are sensitive to UV radiation during the whole life cycle. Sunscreens protect us, so we can longer enjoy sunbathing. WRONG. Sunscreens are adequate protection against sunburn, but their effectiveness decreases after application. Sunscreens do not serve to prolong our stay in the sun, but that it would be inevitable during sun exposure increased protection. We should not stay in the sun longer than ?? it is recommended to set the SPF (Sun Protection Factor). Avoid sun exposure between 11 and 16 hours. EXACTLY. At that time the Sun in the highest position over the horizon, so the UV radiation is strongest. If you do not feel the heat from the sun, we will not get a sunburn. WRONG. UV radiation may not be felt, because it is absorbed by the external layers of the skin. Heat causes the sensation of infra-red radiation. UV radiation has no adverse effect to the skin but also the eye. EXACTLY. The best-known effect of UV radiation on the human is body burns, but UV radiation can cause the development of cataracts (cataract). People with white skin and red hair are more sensitive to UV radiation. EXACTLY. People with fair skin and red hair is the group that is most sensitive to UV radiation. The adverse effects of sunburn are cumulative. EXACTLY. The ability of the human body to protect itself from UV radiation and repair the damages caused decreases along lifetime. UV radiation is not harmful in the winter and in the spring. WRONG. The intensity of UV radiation also depends on latitude, altitude and reflection on the ground, and is highly reflective snow and refuses to 80% of the radiation. Children should be well protected. EXACTLY. Children's skin is particularly sensitive, and the cumulative effect of UV radiation good protection at a young age is a good prevention for later. Skin should be exposed to the sun because UV radiation stimulates the production of vitamin D. WRONG. The time of exposure required for the production of vitamin D is so short, that for the necessary dose not need to sunbathe. The shorter the shadow is the result of higher elevation of the Sun, and therefore more intense UV radiation. I can not get sunburnt while in the water. WRONG. Water attenuates UV radiation, but you can easily get sunburn while swimming. The higher the altitude UV radiation is harmful. EXACTLY. The higher the altitude the UV radiation is more intense, because for a short time in the atmosphere is absorbed less. The cheapest and best protection from the sun is shadow. CORRECT / WRONG. The shadow shield prevents direct UV radiation, but not from the reflected and scattered, which may also be so high to cause burns.